At this week's Virtual Worlds Education Roundtable, I'm going to focus our Open Forum discussion on a few issues: what would educators most like to know about Humble's plans? What issues pertaining to virtual-worlds education would they most like him to address during his first year? How do you feel about renewing work on interoperability with OpenSim grids? Could you clarify Linden Lab's vision for educational use of its grid? How likely are some sort of out-of-world backups similar to those in much of OpenSim? 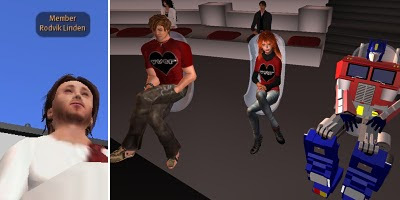 Would you come to a VWER meeting? Educators, what would you like to ask the CEO? ...another idea that would be nice is if they raised the prim limits on the current land that they have. Linden Lab has already recently addressed the issue of educators in SL. See their official statement at the end of this article from last month. I'd expect anything Rod says on the subject would be just a rewording of that. Path, I read that piece by Jeff Young, and he and you did an excellent job. That said, the LL statement falls short of the sort of explanation that many of my VWER colleagues want. There are, aside from tier, several questions that came up last week at VWER that LL might address to calm some very frayed nerves and restore trust in the company and its product. That statement does little to regain the trust lost over the last year. Perhaps if LL asked educators what they need to continue their work instead of migrating to another platform. I'll concede that LL being a sponsor of VWBPE is a positive move. It may be a way for them to gather the sort of information they need to better serve education customers.